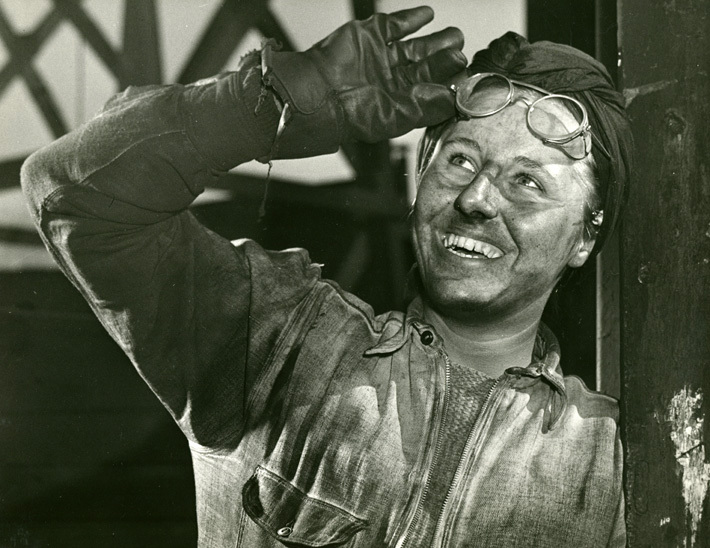 Lillian Markowski, age 20, an engine cleaner for the Long Island Railroad. Markowski took over her fiance’s job when he joined the Army. Her brother was also a soldier. Photo by Roy Pitney, February 2, 1943, Ivy Ledbetter Lee Papers (MC085), Box 103, Folder 4. From the 1950s onward, comics and their bright colors, bold drawings, and interesting stories have captivated a young American demographic. However, their popularity drew in other eyes, too. Civic and political groups took notice of this market audience and attempted to reach them by utilizing the medium as a teaching tool. The goal was education, not entertainment. Pulled from our Public Policy Papers and University Archives here at the Seeley G. Mudd Manuscript Library, these comics demonstrate a mass market approach to education by unconventional means. Materials for an unpublished comic book found in the Fund for the Republic Records (MC059) provide insight into the motivations and decision-making process for these publishers. In 1955, Dan Barry proposed a comic to Fund for the Republic provisionally titled “Our Civil Liberties, Their Meaning, and the Threats They Face”. Noting the “70 million regular readers” of comics as well as the disparity between 43% of the “newspaper public” reading the editorial versus 83% reading the comic strips, Barry articulated the potential and “great need for free-minded liberal material in this powerful medium”. 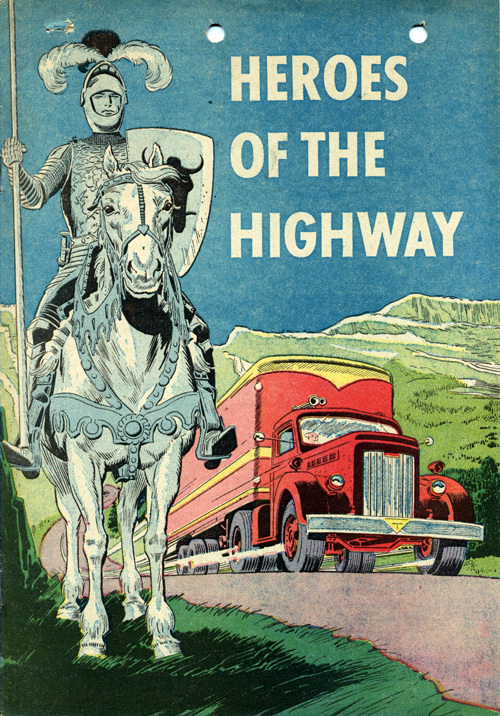 “Heroes of the Highway,” 1952. This comic book served as proof of concept to Fund for the Republic for the 1955 proposal. Fund for the Republic Records (MC059), Box 93, Folder 21. With Father’s Day coming up this weekend and the United States in the midst of a particularly contentious election season, this seemed like perfect timing to highlight a 1912 pamphlet found in the Princeton University Publications Collection (AC364), “A Princeton Student’s Letter to His Father and His Father’s Reply” (Box 2). For the next twenty-three minutes, Stevenson and a group of experts in the field present a grim assessment of the possible consequences of America’s nuclear testing: sickness, war, and horrors unknown. The resulting film Princeton: A Search for Answers won an Oscar in 1974 for Documentary Short Subject. Film producer and director Joshua Logan ’31, who had started his stage writing and directing career in Princeton’s Triangle Club, was one of the first to see it. “I not only believe that it is a moving, funny, and stimulating account of a University I once knew but had almost forgotten,” he wrote to his fellow members of the Academy. “It tells about the gleam that flits across the human mind and gives us all something to hope for, to live for. It makes the human race quite a bit more respectable then (sic) we have recently thought it to be.” The film which has recently been remastered (2013) is featured here. In order to write the film treatment and script, Dewitt Sage spent several months on campus, attending classes and seminars, and talking with students, faculty and staff. Once the film treatment was approved, Julian Krainin took over to supervise the actual camera work. During 1972 and early 1973 fourteen and a half hours of 16mm color footage was shot for the thirty minute film. The outtakes are kept in the University Archives. To accompany the film, the Office of Communications produced a handsome brochure with quotes and information about the faculty featured (see SearchForAnswers.pdf). As already suggested by the title, the film’s main emphasis is on education, scholarship, and student-instructor relations. The film includes footage of tutorials and lectures by physics professor and Dean of the Faculty Aaron Lemonick (1:50, 9:11), and professors Edward Cone (Music, 3:01, 29:48), John Wheeler (Physics 7:05), Daniel Seltzer (English, 12:39), and Ann Douglas Wood (English, 25:02). Wheeler is filmed during a lecture about the implications of black holes (he is credited with coining the phrase in 1967), while Dan Seltzer teaches a Shakespeare acting class and lectures about Henry IV (Part 2). Additional footage features Princeton president William Bowen during a question and answer session with alumni and undergraduates (9:55, 26:11, 27:49) and the work of two graduate students: Niall O’Murchadha (Physics, 5:10, 26:51) and Maury Wolfe (Architecture, 16:11). Produced only a few years after the introduction of co-education in 1969, at a time when diversification of the student body was a priority for Princeton, women and African American students feature prominently in campus scenes (9:40, 20:56, 24:36) and in the class rooms. There is little emphasis in the film on extracurricular activities. In addition to footage of the Glee Club singing Bach in Alexander Hall (directed by Professor of Music Walter Nollner, 17:47), sport scenes are limited to marathon running and rowing (23:25). Additional footage includes students sharing their views of Princeton in a pub (19:45, the legal drinking age was still eighteen!) Some historical photographs and footage is shown at 22:27, including a fragment of a chemistry lecture by the famous Hubert Alyea (previously featured) and the Triangle Club. In this short video from around 1983, President Bowen discusses Wu Hall, the then-new dining facility for Butler College. The video highlights three elements that played increasingly significant roles in shaping Princeton over the following decades: the support of alumnus Gordon Wu, the residential colleges system, and the architecture of alumnus Robert Venturi. We don’t know the exact purpose for which this video was created, but it may have been part of the promotional material for A Campaign for Princeton, the fundraising campaign that officially ran from 1982 to 1986. As previously discussed on this blog, A Campaign for Princeton was enormously successful, bringing in an average of $1,000,000 per week at its height. 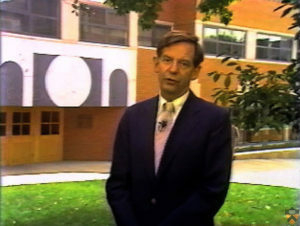 In 1981, before the campaign even officially began, alumnus Gordon Y.S. Wu donated $1,000,000 to it. Wu earned a Bachelor’s of Science in Engineering from Princeton in 1958 and subsequently returned to his native Hong Kong. There, he founded Hopewell Holdings, a firm whose notable projects have included highways, hotels, railroads and power plants throughout Asia. Wu has been described as one of the wealthiest businessmen in Hong Kong and as one of the most influential engineers and businessmen in the world. As A Campaign for Princeton was officially being launched in 1982, Princeton announced that Wu had donated an additional 25 million Hong Kong dollars in honor of his class’s upcoming 25th anniversary reunion. The funds, then equal to approximately USD $4.3 million, were used primarily to construct a dining facility for the then-new Butler College. As generous as these donations were, they represented only a small fraction of what was to come. In 1995, Wu made a historic pledge to the With One Accord fundraising campaign, which was held as part of the University’s 250th anniversary. That year, Wu pledged to donate USD $100 million, the largest gift ever by a foreigner to a U.S. university, with the last payment scheduled to coincide with his class’ 50th anniversary reunion in 2008. Wu is currently serving as a Trustee of Princeton University, with a term ending in 2012. Although dwarfed in magnitude by his later donations, Wu’s 1982 donation has impacted the lives of literally thousands of Princetonians. It gave physical form to President Bowen’s aspirations for the residential college system, which has defined the Princeton undergraduate experience for every class since. President Bowen (right) formed the Committee on Undergraduate Residential Life (CURL) in 1978. Made up of administrators, faculty and students, the committee was charged with addressing the intertwined issues of Princeton student housing, dining and socialization. Although some of the proposals in the committee’s final report – particularly those relating to eating clubs – did not come to pass, its primary proposal, the establishment of three new residential colleges, came to fruition within a few short years. The construction of Wu Hall transformed this “group of dorms” into a true residential college. As the first Master of Butler College, Emory Elliot, said near the end of the first semester that Wu Hall was open, “It’s enabled the spirit of the college to come into full blossom.” He also described the new servery and dining facility as having a “friendly atmosphere conducive to having people come together.” Footage about Butler College and Wu Hall after the 2009 renovations can be found here. Today’s post was written by Lisa Dunkley ’83, Project Analyst at the Office of Development, who worked under Fred Hargadon from 1988 to 1994. “Yes!” Those of us who knew, or knew of, Dean Fred Hargadon cannot hear that exclamation without thinking about the blunt, welcome way successful Princeton applicants (and Stanford students before them) learned their admission results. The phrase became so strongly identified with him that Hargadon Hall, the Whitman College dormitory that was an honorific gift from several anonymous alumni, has the word engraved in stone at the building entrance. The simplicity of the message belied the long hours and deep experience that led to those decisions. I worked in Princeton’s undergraduate admission office from 1988 to 1994, and was one of the first three people the Dean hired. I first met Fred at my interview—he is a tall, unassuming and often endearingly rumpled man. I was working in book publishing, and he is a voracious reader. We talked at length and with ease about books, and on occasion he would interject a question. I was a little tense, waiting for the “real” interview to begin. After about 45 minutes or so Fred stood and thanked me for coming: that was the interview. In retrospect I was impressed at how my answers revealed much more than I realized, an experience I found as disconcerting as it was fascinating. When Fred offered me the job a few weeks later, there was only one answer: Yes! An admission neophyte, I was clueless about how differently the office operated under his watch compared to his predecessors, but I didn’t particularly care. Fred’s approach seemed right to me: admission was all about the applicant: our responsibility was to pay very sharp attention to all details and to make the playing field as even as possible for everyone, from the child of itinerant farm workers to the offspring of royalty, both real and conferred. Our job was to render a reasoned opinion about how well each student took advantage of whatever resources were at his or her disposal. “Children don’t choose where they grow up,” he once told me. Fred was very open about how he ran the annual process and discussed it with audiences on many occasions over the years (of which this videotape is one). When he was asked how he managed to balance all of the competing interests at play in each year’s applicant group—a frequent question—he said that his goal was to leave every special interest group only slightly unhappy. Staff training was unlike anything I’d known before. During the admission season, “first readers” like me passed our folders to more senior officers. Later we would review the finer observations they had added to our summaries: it was the best kind of one-on-one tutoring we could have. Summers are traditionally slow in admission, when most of us either meet with campus visitors or take vacation. In this “off season,” Fred’s strong preference was for us to read books of all kinds. He had a list of recommendations (from On Excellence to The Phantom Tollbooth), but there was sound reasoning behind this exercise: it was our responsibility to have a wide, deep and flexible vocabulary to describe each applicant with as much accuracy as possible. “There is a right word for everything,” he told us. In a previous blog we discussed the three-year $53 Million Campaign, launched at the beginning of Robert’s Goheen’s presidency in 1959. On an even larger scale was the five-year fundraising campaign that was launched on February 19, 1982 during the presidency of Goheen’s successor William G. Bowen. The goal for “A Campaign for Princeton” was set at $275 million (raised to $330 million in January 1984). Three years into the campaign, the fund drive ran like a “well-oiled machine,” according to the Daily Princetonian, bringing in more than $1 million a week. Fifty-five professionals worked with a body of 2.500 alumni volunteers, spread over seventeen regions, who were trained to ask fellow alumni to give at their maximum capacity. Featured here is “You Ask For It: An Introduction to Campaign Solicitation,” an instructional film that, however much a product of the 1980s, may still be of interest for today’s fundraisers. The campaign goals were summarized in a Campaign Primer, published at the launch of the campaign. A full list and description of the goals, which included academic programs, facilities, student aid, and residential colleges, can be found at CampaignPrimer.pdf. Alumni solicitors prepared to “make an ask” to prospective donors with the help of a written solicitation plan, provided by Princeton’s campaign staff. The solicitation plan, according to the Volunteer Handbook, contained particular information about the “prospect” as well as specific guidelines on how to work with the person to “help ensure maximum giving.” For the first time in Princeton’s fundraising history, alumni with capital gift potential were asked to make one single commitment to the campaign that included both Annual Giving (AG) and a capital gift (this was known as a “joint ask”). As the campaign was spread over five years, it allowed for all alumni to be addressed with their class’ major reunion goals in mind. Solicitors were not meant to be bashful about their “ask.” Outright gifts of cash or assets (generally securities) were first priority, according to the Volunteer Handbook, but if that was a problem, other charitable tax planning techniques were encouraged. “If you are persuaded that a donor simply cannot meet the requested level through an outright gift, you should then introduce Planned Giving to the negotiation.” Since these techniques were rather sophisticated, further negotiations were referred to Princeton’s Planned Giving staff. The above VHS video features two alumni ‘novices’ to the soliciting process, who ask an experienced alumnus named Jim, a regional chairman in charge of Major Gifts, in a staged interview for advice. The woman in the film is in charge of “Special Gifts” for her Class’ 10th Reunion, and the male novice alumnus is asked to solicit money for a large capital gift from a man who never donated more than $2.500 for Annual Giving. The film lets Jim go back in history, showing one failed soliciting attempt at the beginning of his career, because he was not well enough prepared (1:05). This is followed by his account of one recent successful attempt, in which an alumnus ended up giving much more than he initially thought he could manage, partially through Planned Giving (5:03). Although the University Archives contain a lot of information about the campaign itself, information about the VHS film featured here is lacking. In the lists of Regional Chairmen Major Gifts, provided in the Volunteer Handbook, there is no James or Jim, hence the people in the staged interview may not be actual alumni. If you can provide more information about the making of the film, please let us know! For more information on the campaign itself, see The Story of A Campaign for Princeton, 1981-1986 by William McCleery. After the 1960 and 1961 “Princeton newsreels” featured last week, which marked a new stage in Princeton’s public relations efforts, it is interesting to make a 30-year leap to view a film that was produced for the Admissions Office by Andrew Greenspan: “Princeton University: Conversations that Matter” (1991). Focusing on the academic climate and intellectual exchanges, the film uses a markedly different format than the Orange Key Society film of 1962, which was also aimed at prospective students. This film uses footage of discussion groups, lectures and seminars, and individual meetings between students and faculty, touching upon a wide range of subjects within the sciences and humanities. Professors featured include, among others, Cornel West (African American Studies, 1.13 and following), Peter Brown (History, 4:31), Robert Fagles (reading from his translation of the Iliad 6:57), Toni Morrison (English, 8:27 and following), John Fleming (English and Comparative Literature, 9:05), John Conway (Mathematics, 12:36), Steve Mackey (Music, 18:24 and following), and Michael Littman (Mechanical and Aerospace Engineering, 19:19). In addition, the film addresses individual students’ research and creative writing projects. The footage includes an acting class by playwright David Rabe (16:02) and training sessions with basketball coach Pete Carril (2:50 and following). The film won a Gold Award from the Council for Advancement and Support of Education (CASE). 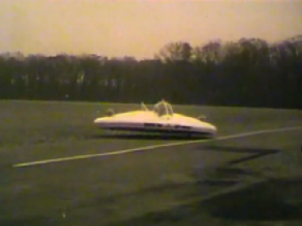 This VHS video is part of the University Archives’ Historical Audiovisual Collection (item no. 1293).